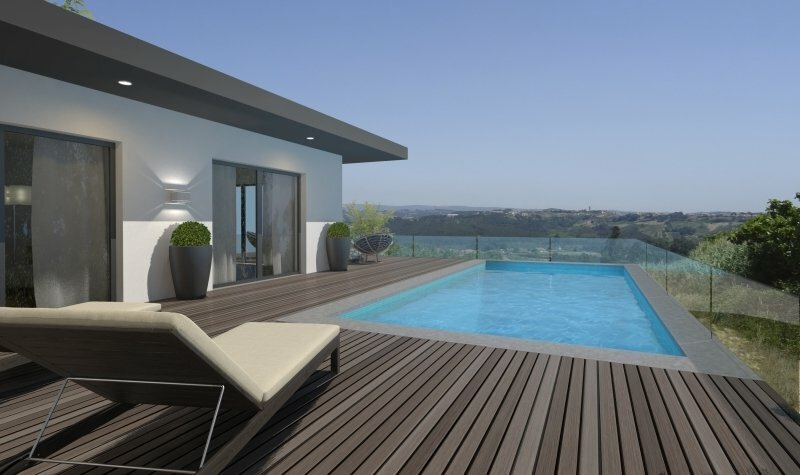 Stunning spacious 3 bedroom modern villa (under construction) located in a quiet area in the sought after village of Alcobaca with magnificent views over the countryside with stylish private swimming pool, car port housing 2 cars and landscaped gardens, 15 minutes from the amazing beaches of the Silver Coast. The modern, contemporary property is built to a high specification and with high quality finishes. The spacious accommodation comprises lounge, dining area, open plan modern luxury kitchen, 3 bathrooms, the master bedroom has and en-suite and dressing room, utility room and ample storage. It has many unique features including solar panels, electic shutters and automatic gates. Lisbon and the airport are a 45 minute drive.